On this 24-day overland camping tour you spend the first days exploring the bustling Mother City before you enter Namibia and to do a canoe trip on the Orange River. You stop at the Fish River Canyon and continue into the Namib Desert to walk in the wilderness and join guided game drives. At Sossusvlei you will climb the dunes for a spectacular view and drive through the Namib Naukluft Park to reach Swakopmund. Along the Skeleton Coast you will visit Spitskoppe and appreciate the Bushman rock paintings at Brandberg. Look for the dangerous Big Five in the Etosha National Park. 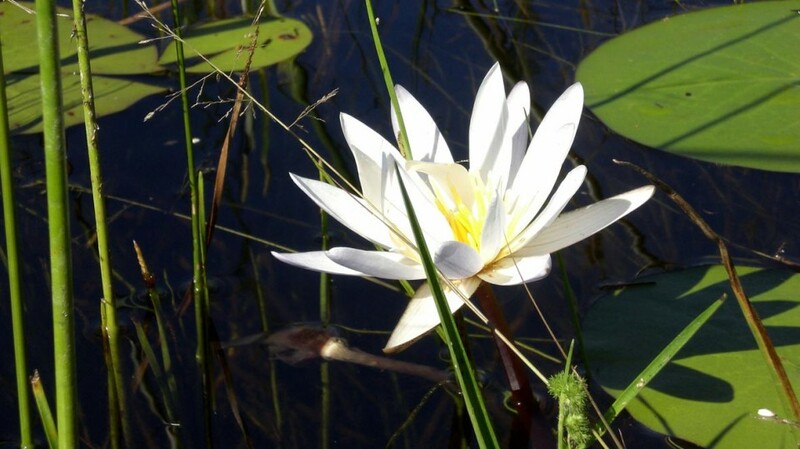 With motorboats you will cruise into the Okavango delta and later continue by Mekoro. 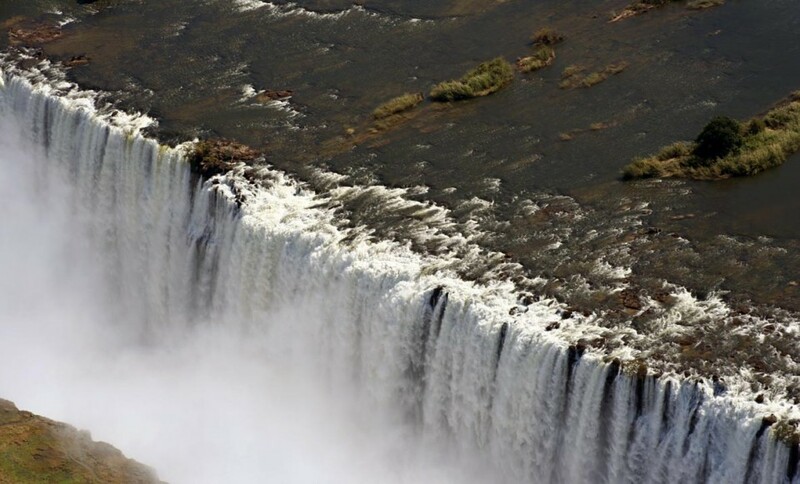 Travelling through the Chobe National Park, you cross the border to Zimbabwe to visit the stunning Victoria Falls. You reach Hwange and spend time on game drives before you get to Bulawayo. 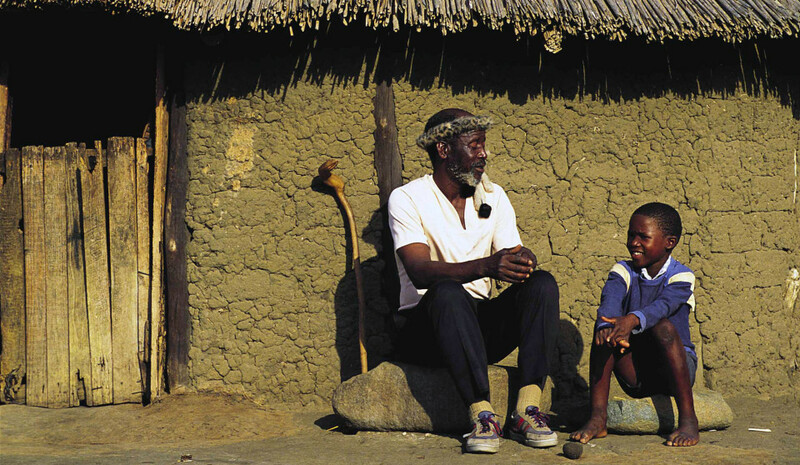 You will travel back to Johannesburg via the Limpopo Valley. You will be met by the team in Cape Town to spend the afternoon exploring and visiting the sights. You have one and a half days here, hiking up Table Mountain, visiting Cape Point, the Waterfront, Hout Bay, a wine farm and numerous other sights. Our final program will be dependent on the weather. You will overnight at a beachfront lodge for the two nights. Lunches and both evening meals are for your own expense. You leave the Mother City behind, and after a last view of Table Mountain from across the bay, you travel north through the “Swartland” along the West Coast into Namaqualand. In the early spring this usually barren area comes to life with vast expanses of colourful desert flowers. You will overnight along the coast in basic accommodation. Today you cross the border into Namibia and travel the short distance to the base camp on the banks of the Orange River from where you go on a canoe adventure. Once you have packed all of your gear, you set off into the wilderness in twin canoes. The Orange River is an awesome spectacle, like a green ribbon winding its way through the desert and past the towering mountains of the Richtersveld National Park. You will spend one night camping on the river banks under the desert skies and will then return to the base camp’s relative comfort. 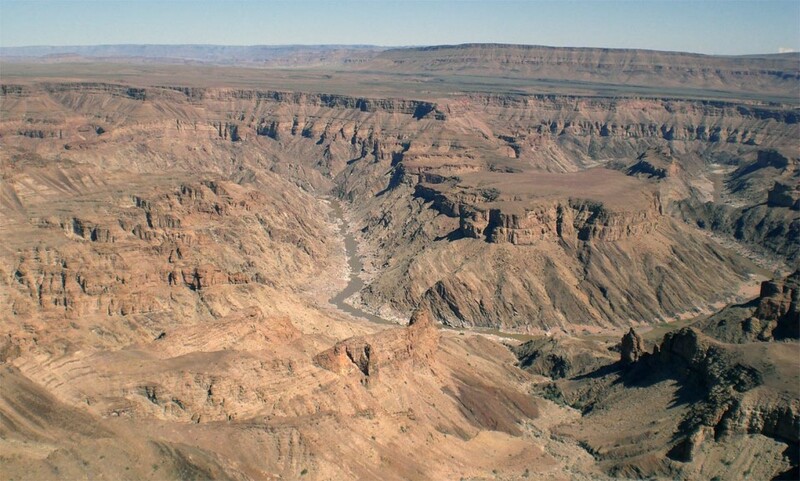 Today you head directly to the Fish River Canyon, the second largest canyon in the world. After visiting the viewpoints and exploring the edge of the Canyon, you continue into the Namib to set up camp in the desert. The campsite is situated on a private nature reserve within the Namibrand Nature Reserve. It is home to numerous species of fauna and flora adapted to live in the desert. The camp is spectacularly built against a boulder between the stark mountains and the red dune-fields. During your stay you we will set out on several expeditions including guided walks and a night drive. This will allow us to observe animals at close range. 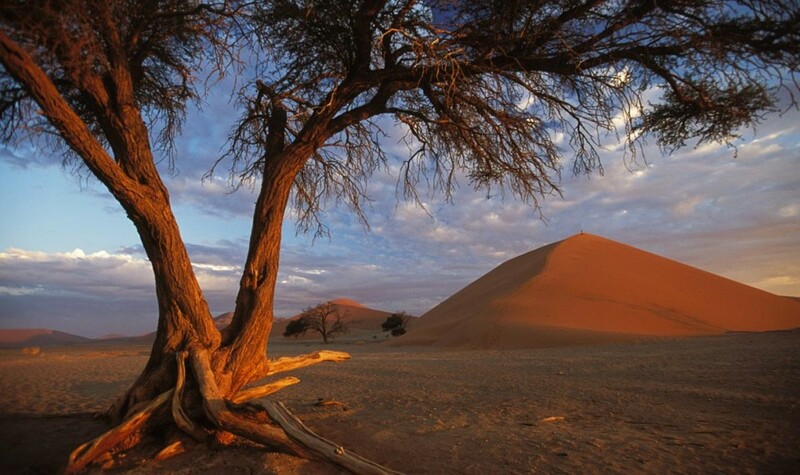 After a relaxed start you travel to the dunes of Sossusvlei. The last part of our journey will be through the thick sand in an open 4x4 vehicle. After climbing to the top of the dunes for the spectacular view from the summit, you return to the vehicle and continue to the quirky trading post of Solitaire where you will camp the night. It is a short journey today to the seaside town of Swakopmund. You cross the Kuiseb Canyon and the Naukluft Park to Namibia’s ‘adventure capital’. You will overnight for two nights at a lodge in Swakopmund. The lodge is ideally located for exploring the town of Swakopmund with its beaches, markets, curio shops and restaurants. The town has a huge variety of adventure options: try quad biking, sky diving, horse riding, dune boarding or just lazing on the beach. The nightlife of Swakopmund is also worth experiencing. Sample fresh seafood at a local restaurant – for your own account. 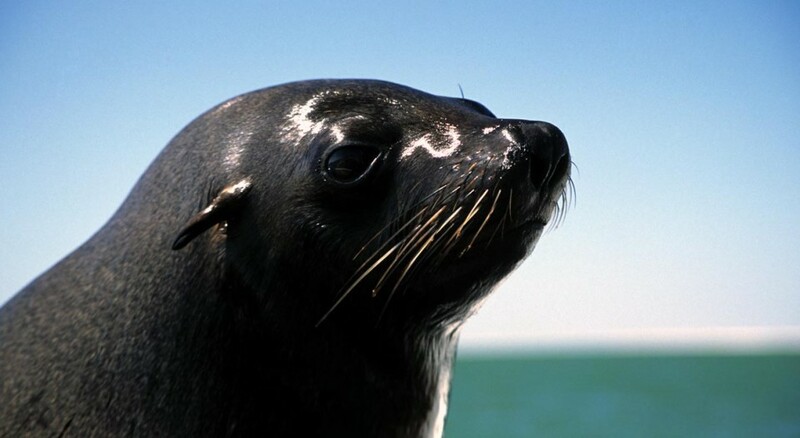 Today you head north along the Skeleton Coast to the seal colony of Cape Cross before venturing back inland. You travel through the desert to visit the Bushman rock paintings at Brandberg, where after you set up camp and spend the night at the foot of the mountain. With a little luck you might see the rare desert elephants. Etosha National Park is an incredible wildlife experience: mirages over the vast salt pan, animals flocking around watering holes and seeing black and white rhino and the black-faced impala. After setting up camp you will go on an afternoon game drive and spend the evening watching animals drinking at the camp’s floodlit waterhole. Continuing through the reserve, you camp another night. One night you dine at a camp restaurant at own expense. Leaving the harsh desert landscapes behind, you will travel north to the tropical and green Caprivi area. Tonight you camp on the banks of the mighty Okavango River. A short drive today along the ‘pan handle’ from where you will take a motor-boat trip into the heart of the Okavango Delta. Once in the delta you continue by Mekoro - the traditional dugout canoe - to a remote camp. This is truly nature’s wonderland with papyrus plants fringing the natural channels, more than 70 species of fish, the abundant lechwe antelope and huge crowds of elephant and buffalo. You will spend two nights camping and exploring this remote paradise. After a morning exploring this wilderness, you can enjoy a mekoro and boat transfer back to the vehicle. You will then drive through the Kalahari to Maun to relax at the lodge’s swimming pool for the afternoon. Camp the night. After a relaxing morning you leave the camp in Maun and continue your journey through the Makgadikgadi Salt Pans to the oasis-like camp of Nata. Traveling north through the Chobe forest reserves, you head for the border town of Kasane. From here you will enter the Chobe National Park in search of the large concentration of animals that this area is known for. Late afternoon you will cross the border and drive the short distance to the Victoria Falls where you spend the following nights in the lodge’s comfort. One of the nights you will enjoy a traditional ‘braai’ and experience traditional dancing around the pool. This morning you wake up in the ‘adventure capital of Africa’ - Victoria Falls. You will have a full day to experience the falls or get the adrenaline pumping with white water rafting, bungee jumping or an airplane flight over the falls. (These are optional activities, not included in the rate). After some free time in the town, it’s back to the wilderness. You travel the short distance to Hwange National Park, the largest game reserve in Zimbabwe. After an extensive game drive or game walk, you overnight at a remote camp overlooking a waterhole teeming with game. Today you travel south to the wide streets of Bulawayo - Zimbabwe’s second largest city. You then continue to the Matobo area – this area was called ‘bald heads’ after the round and smooth granite boulders of the region. In the afternoon you enjoy a game drive into the national park and track rhino on foot. Tonight’s camp is situated amongst the precariously balancing boulders that this area is known for. Travelling south today, you cross the border back into South Africa to the bushcamp situated on a private game reserve in the Limpopo valley. This morning you go on a short walk to view the magnificent bushman paintings surrounding the camp before returning to Johannesburg. You arrive at the lodge in Johannesburg in the late afternoon. - 14 nights are spent in spacious 2-man dome tents (2,2 x 2,2m) on campsites with good ablution and other facilities. - 3 nights are spent in spacious 2-man dome tents (2,2 x 2,2m) in basic bush camps with very basic ablutions (bush toilet + bucket shower). - 6 nights are spent in twin rooms at nice guesthouses/lodges. 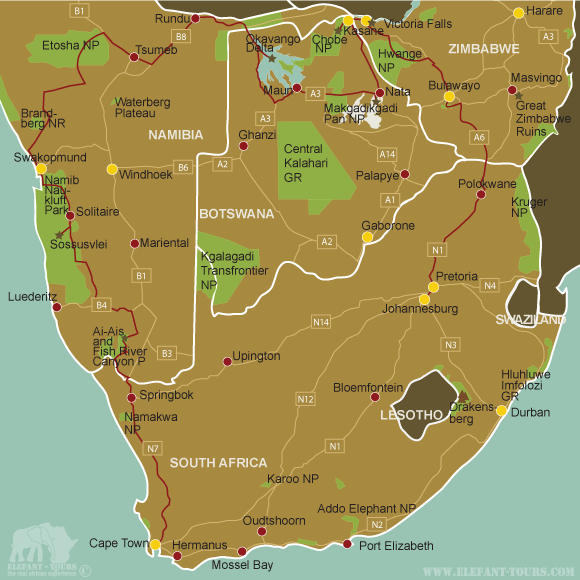 - In general European citizens do not require a visa for South Africa, Namibia and Botswana. For Zimbabwe a visa is usually required. - As the north of Namibia, Botswana and Zimbabwe are situated within a malaria area, we would recommend some precautions. Please speak to your doctor or travel clinic about the different prophylaxis and their effects and side effects.